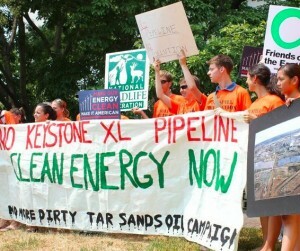 On August 20, 2011, we will begin our demonstration in front of the White House, practicing peaceful civil disobedience to oppose to the Keystone XL tar sands pipeline. This is a challenge. We’re already on our way to making this the largest collective act of civil disobedience in the history of the American climate movement – over 1,000 people have signed up to join the sit-in. That’s an impressive number of people coming together to do something hard – take a legal risk in Washington’s swampy heat to stop this monster project. We’re now aiming to double that number to 2,000 before the action begins in August. But even this might not be enough. The tar sands industry is upping their pressure: just this week they bought up more high-powered Washington lobbyists, and are ramping up their PR machine to push President Obama into making the worst climate decision of his Presidency. This entry was posted in Events, Tar Sands and tagged Protests. Bookmark the permalink.